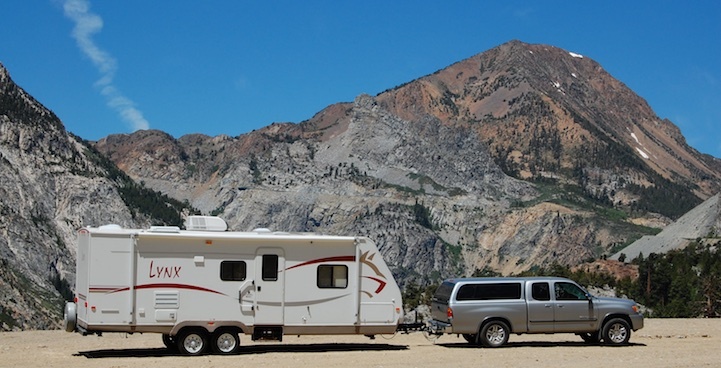 Many RV full-timers go through more than one RV before settling on their final choice. This is actually a good thing! Before hitting the road, it’s hard to know whether the lifestyle is going to work for you. Rather than investing a huge amount of money and then discovering you don’t want to continue, it makes sense to get a modest rig at the outset and then upgrade if you fall in love with the lifestyle. 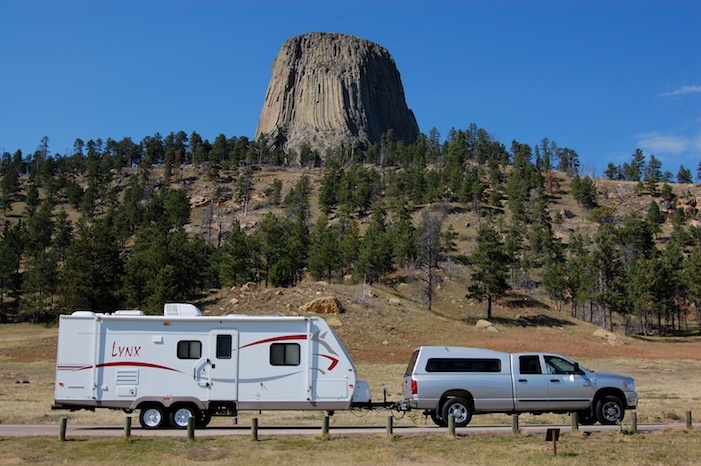 Also, the choice of RV and tow vehicle (or toad for a motorhome) may depend a little on what kind of vehicles you already own. When we decided to go full-time, we already owned a 2004 Toyota Tundra and a 2005 Fleetwood Colonial Pop-up Tent Trailer. We have lots more info about our popup tent trailer HERE. This was a charming little rig that taught us a lot about camping, RVing and traveling. We spent 157 nights in it in two years! It was those wonderful experiences that first made us think about full-timing. If your full-time RV travels are a hazy dream out there on the horizon, consider getting something little and cheap at first, like a pop-up, that you can fool around in on weekends and during vacations. When we wanted to get an RV for full-time use, motorhomes seemed too expensive and didn’t appeal to us. We also knew nothing about diesel trucks. So we decided to get a trailer the Tundra could pull. We bought a 2007 Fleetwood Prowler Lynx 27′ Travel Trailer. It felt palatial! We upgraded this first trailer with a small solar power system that was sufficient for skinny living off the grid full-time. At just 7000 lbs., this trailer was okay for the Toyota Tundra to tow on flat ground. Any kind of a rise, however, and the truck strained. We knew we needed a bigger truck after the first month when we climbed over Tioga Pass outside Yosemite National Park in California. With the gas pedal floored, we did a whopping 28 mph over the whole pass. Not fun! We did tons of diesel truck research and bought a 2007 Dodge RAM 3500 single rear wheel 4×4 pickup truck. We installed a cap on the pickup so we could store things in the bed of the truck. Our 2007 Dodge Ram 3500 diesel truck could tow our 27′ 2007 Fleetwood Lynx travel trailer with ease. In 2014, after owning the truck for 7 years (and 85,000 miles) we upgraded the truck with an Edge Diesel Evolution Tuner to give us more power while towing, more engine temperature data while climbing the big mountains out west, and better gas mileage in all conditions. Although the travel trailer felt huge at the outset, by the middle of our first winter, after many cold, dark days and very long nights huddled inside, we realized we needed a bigger trailer too. Fortunately, we had bought a truck that could handle a big fifth wheel. 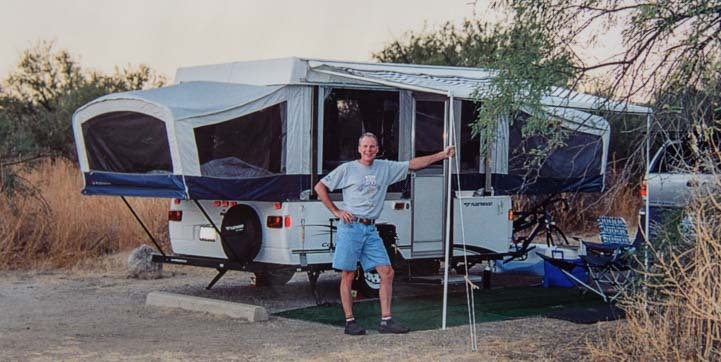 We did lots more research, visited several factories, and ended up buying a 36′ long Hitchhiker LS II 34.5 RLTG Fifth Wheel in 2008. That is our current rig, and we love it! We have lots more info about our fifth wheel trailer HERE. We immediately outfitted the fifth wheel trailer with a big solar power system, and in 2009 we installed a vent-free propane heater on the fifth wheel. In 2015 we did a disc brake conversion on the trailer, upgrading from electric drum brakes to electric over hydraulic disc brakes. This greatly improved our safety on the road. One of the things that is really important when buying a trailer is the Cargo Carrying Capacity. 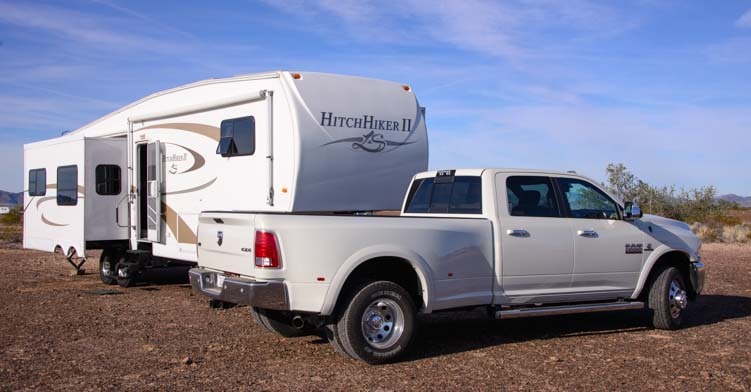 Our Hitchhiker fifth wheel has a fairly ample cargo carrying capacity (3,439 lbs.) compared to many other similar fifth wheels on the road, but over the years we have found that it is still a bit skimpy. We’ve dedicated a whole blog post to why the cargo carrying capacities of different trailers is an important consideration. 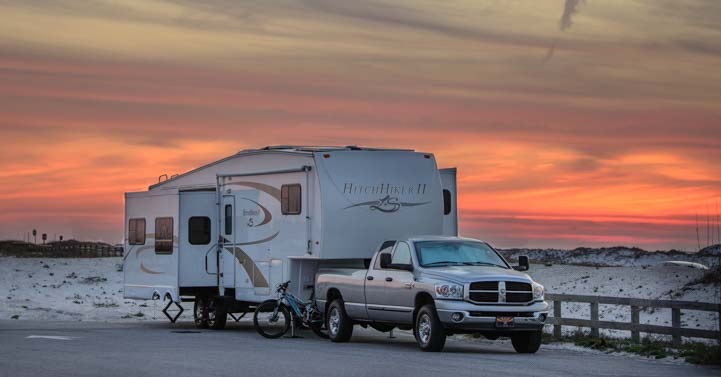 We also have some info about choosing an RV for full-time living and some ideas of what to look for in a full-time fifth wheel trailer. Our fifth wheel trailer was the very biggest trailer our truck could tow, and when we hit the big mountains in the west, the truck struggled. The cold air intake and Edge tuner helped, but the truck bed was overloaded by the pin weight of the trailer combined with all the goodies we like to keep in the truck bed. We researched dually trucks for two years, and then right before Christmas in 2015, we traded in our 2007 Dodge Ram 3500 single wheel truck for a 2016 Ram 3500 Dually. How to Put Diesel Exhaust Fluid (DEF) in a Truck Without Spilling and Which Brand is Cheapest!